I think the fact that my Urban Outfitters wishlist isn't nearly as long as my combined Anthropologie wishlist speaks for itself. I'm definitely more of a classical and whimsical girly-girl than a hipster. 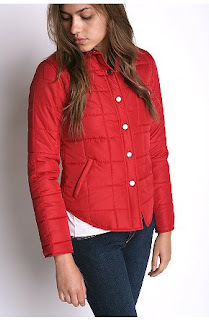 BDG Workwear quilted jacket, $98. This jacket's water-resistant outer shell, fitted cut, and cheery red colour make it perfect for a gray and rainy urban landscape such as Vancouver's. However, it'd look equally at home on a farm-girl about to go on a first-date hayride, don't you think? Free People lambswool fringe jacket, $168. A couple months ago when I was coveting the Free People 'Bird of Paradise' dress, I popped into the only Urban Outfitters in Vancouver and found out--much to my disappointment--that Free People items weren't available in Canadian stores. How lame is that?! 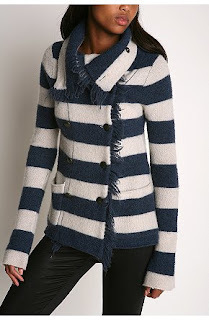 It's such a shame because the fringe and thick gray and navy stripes on this sweater coat are so appealing. Silence & Noise striped sweater hoodie, $39.99. This is such a cool variation on two classic staples--striped tops and hoodies. It's much more distinctive than the standard Lululemon hoodie. Kimchi Blue voile slub mix tee, $42. Honestly, how can I resist a feminine top that mixes two shades of my current colour obsession? Very nice picks. I love that striped navy sweater coat too. I like how it looks kinda nautical to me with the stripes and the buttons, but yet not with the fringe. Happy early Birthday!